We propose ‘LunarCube’ to extend the affordable and successful CubeSat standard to support cis-Lunar missions. 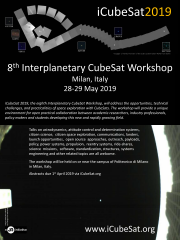 Over the last decade, CubeSat has evolved in the direction those of us interested in lunar and planetary exploration would like to go: CubeSat-based programs now support cutting edge multi-institutional multi-disciplinary science using spatially and temporally distributed systems, while keeping costs low. LunarCube, analogous to CubeSat, allows higher risk implementation, thereby keeping costs low, but extends CubeSat capabilities in two stages to support operation in deep space and the lunar surface as an analog of most solar system real estate. A standard ‘bus’ provides standardized interfaces and shared access by guest ‘instruments’ to all subsystems using existing SmallSat protocols. Stage 1 would specify some additional capability in five key areas: 1) profile: somewhat longer duration (many months instead of many weeks); 2) form factor: small, but potentially larger volumes as needed; 3) control: active attitude control, propulsion; 4) information transfer: more robust, autonomous communication and C&DH systems, and 5) thermal/mechanical design: greater hardness to deep space radiation using, for example, MilSpec components, and ruggedness for extreme thermal variation. The first four would give access to lunar orbital space to provide, for example, communication satellites for cis-lunar or deep space. The fifth would allow access to, as well as survival and operation for at least a limited duty cycle on, the lunar surface. The somewhat larger volume would accommodate the additional needs, or allow several users to fly experiments. Stage 2 would enhance capability by allowing the technology impact to increase, enabling incorporation of state of the art or even currently ‘under development’ technologies in several key areas: 1) electronics, 2) autonomy; 3) precision navigation and control; 4) full deep cryo operation for ‘cold cubes’; and 5) advanced payload integration. At this stage, 24/7 operation anywhere on the lunar surface would be possible and the LunarCube could be a virtual ‘smart phone’ with a ‘nano–rack’ representing a variety of experiments, as open access software applications. Transportation to final destination could occur either as secondary payload on larger orbiters/landers, or via the low impulse micro-thruster propulsion systems currently under development. LunarCube provides a platform that advances scientific exploration and demonstrates core technologies to support effective operation beyond Earth orbit.